Welcome to Markplex tutorial 103 in this collection of tutorials designed to help you learn TradeStation EasyLanguage programming skills. Please join our email list if you have not already done so and we will let you know when we release new tutorials or programs. This tutorial applies to TradeStation (but not MultiCharts) because it uses TradeStation’s object oriented capabilities. XML is an acronym for EXtensible Markup Language. XML is designed to describe data in a way that can be read and understood both by people and computers. An XML file could be used to store data which could then be read and reused by the same or another program. For example, you could create a program such as the one I wrote in tutorial 102 which processes a vast amount of data to create a volume profile. This volume profile could be stored in an XML document so that the data wouldn’t need to be totally re-processed from scratch. The XML file created with the tutorial 103 program. 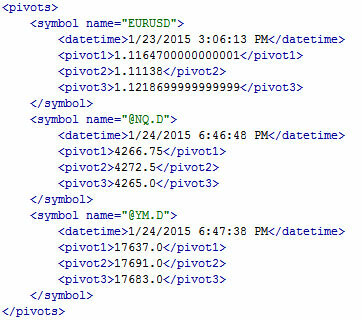 The program reads and stores a datetime stamp and three recent low pivot levels for each symbol to which it is applied. An example of an element. It includes the start and end tags. An attribute provides extra information about an element. In the above image, name is an attribute with the value: “@YM.D”. Everything in an XML document is a node and a XML element is an element node. The text within an XML element is a text node and an attribute is an attribute node. You are free to determine the names of the element nodes, although there are rules such as the name cannot be a number. Each time the program is applied to a new symbol and the program refreshed or removed from the chart, it creates a new element node containing the element nodes: symbol name, a date time stamp and the the last three low pivots. Each time the program is refreshed or removed from the chart, it goes through the nodes in the XML file to check whether data is already stored for that symbol. If data is already stored, it is updated. xmlFileName( “C:\Tutorial103b.xml” ); // Name and location of XML file. Set carefully! This tutorial program is available for immediate download for only $19.95. This tutorial applies to TradeStation (but not MultiCharts) because it uses TradeStation’s object oriented extensions. Gold pass members can copy and paste the program at no cost (see the Gold Pass area below. Make sure you are logged in to the site). For best results, watch this video in full screen HD mode. This tutorial program is available for immediate download for only $19.95. This tutorial applies to TradeStation (but not MultiCharts) because it uses some of TradeStation’s object oriented extensions.